After a stint policing the rough streets of Kansas City, Missouri, Chris Voss joined the FBI, where his career as a hostage negotiator brought him face-to-face with a range of criminals, including bank robbers and terrori A former international hostage negotiator for the FBI offers a new, field-tested approach to high-stakes negotiations—whether in the boardroom or at home. To ask other readers questions about Never Split the Difference, please sign up. Has anyone found the PDF download they promise in the audiobook? I'm sorry, but it seems you're looking for a review to help you decide if you Really want to read this book--if it's worth your time--or not. Wondering if somebody would be kind enough to provide you with that one review which would appeal to your tastes. I have EXACTLY what you're looking for, but why would I provide it for you? I'm thinking No. Go ahead: tell me. Why would I bother saving your time with an eloquent and thorough review that would Definitely appeal to you and surely help you deci I'm sorry, but it seems you're looking for a review to help you decide if you Really want to read this book--if it's worth your time--or not. Wondering if somebody would be kind enough to provide you with that one review which would appeal to your tastes. I have EXACTLY what you're looking for, but why would I provide it for you? I'm thinking No. Go ahead: tell me. Why would I bother saving your time with an eloquent and thorough review that would Definitely appeal to you and surely help you decide? Go ahead: tell me. The answer is the same: it ain't happening. It seems you're wasting your time. The answer is a big, fat No. It seems you're a little stuck right now, doesn't it? My answer doesn't sound it'll change anytime soon--I mean, I'm not the kind of guy who keeps checking his reviews and keeps editing them accordingly, so now what? Looks like you could use some of the tips found in this book. Wasn't it about negotiating? A lot of what affects how much you enjoy these books is, again, how self aware you are or how much consideration you've given to how you talk to people and the best way to get what you want from others. If you already easily have any easy time convincing people, or have thought about it and are self aware of how you behave and talk to others then I don't think any of these things are going to be surprising or helpful but if you haven't ever actually considered the way you interact with people th A lot of what affects how much you enjoy these books is, again, how self aware you are or how much consideration you've given to how you talk to people and the best way to get what you want from others. If you already easily have any easy time convincing people, or have thought about it and are self aware of how you behave and talk to others then I don't think any of these things are going to be surprising or helpful but if you haven't ever actually considered the way you interact with people then maybe this will be an eye opening book for you. Personally I think I've always been a little manipulative so I wasn't all that impressed. The writing was average also so the books clear and easy to read but I wasn't impressed by the writing either. Mark Thanks Thomas. I've put it on my list. I look forward to reading it. I actually TOOK NOTES on this book. Recently, I've snagged a couple interesting titles off the Audible deal-of-the-day. This book popped up and the premise was just so interesting, I had to get it for a couple dollars. Chris Voss, the author, was a lead FBI hostage negotiator and haggled with terrorists, kidnappers, and a host of other bad dudes for a lot of years. I had an initial concern that Chris would be authoritarian and a tad bit self-enamored when I bought the book. The only reason for this being that most "bargain-like-a- Recently, I've snagged a couple interesting titles off the Audible deal-of-the-day. This book popped up and the premise was just so interesting, I had to get it for a couple dollars. Chris Voss, the author, was a lead FBI hostage negotiator and haggled with terrorists, kidnappers, and a host of other bad dudes for a lot of years. I had an initial concern that Chris would be authoritarian and a tad bit self-enamored when I bought the book. The only reason for this being that most "bargain-like-a-boss" books I've read have been that way. But I figured, you don't get to be the FBI's lead hostage negotiator because of a false sense of importance so I figured I'd give 'er a go. And I'm so glad I did. This book appealed to me because I thought, "Hey, I can actually use this to negotiate with agitated patients." But holy moly, Miss Molly. You can use these techniques to smooth out rough conversations with a spouse or family member, ease a tense stand-off with your nine year old that doesn't want to go to bed, and use your super-secret-spy techniques on the vegetable vendor on the side of the road. It's nifty stuff. In reality, the information here is golden. I wasn't flipping through pages thinking, "I should write the world's most basic book on communication too and make money off it." This was actually valuable and evidenced-based. So many of these techniques are things I either use with aggressive/agitated patients, or will start using! Some of it, I realized, I use a rendition of, but not well, because I couldn't put my finger on the mechanics behind it. This is so simple, and yet, art. It breaks things down into simple concepts, but shows it takes practice to hone the skills (obviously, otherwise I'd be sauntering into that lead FBI negotiator position myself). Why should we start our questions with "what" and "how"? Why do we want the other guy to say no? When is it helpful to use the late night FM DJ voice vs. the chipper, friendly voice? I know the answers now. And they make a hecka-lotta sense. If you read one self-help, communication, non-fiction book this year, read this one! Also, the Audible narrator was a pleasure to listen to. He did a wonderful job. Fantastic book. While I recommend it to everyone, I almost don't want to give away a competitive edge and prefer no one reads it--it's that good! Chris Voss is a former FBI hostage negotiator. If you want to learn how to negotiate, he’s your top teacher. Every chapter in his book is a lesson. Each of them feels like an episode of some crime TV series. Every lesson is based on a real-life example from author’s involvement with hostage negotiations. After the storytelling, Chris explains which negotiating techniques worked and which didn’t. At the end of each chapter, there is a nice wrap-up of the key lessons learned. The author discovered that the same techniques he used in life and death negotiations can be applied to everyday conflicts. Whether you are negotiating with kidnappers, trying to get a raise, or just negotiating “bedtime” with your kid, the principles stay the same. The main rule of negotiations is to remember that you’re dealing with a person who wants to be appreciated and understood. “Never split the difference” is an impressive book, filled with practical knowledge. This is not theoretical science. All of those advices were proven right when someone’s life was on the line. You can’t read it like a textbook. This book is written like a thriller. It’s very absorbing and easy to read. After finishing it I feel like not only my negotiation skills improved, but my social skills overall got better. I believe everyone should read it. Most people don’t wake up every day expecting negotiations, but who knows, maybe tomorrow you’ll have an opportunity to discuss something that’s important to you? I can guarantee that such talk could go WAY better if you read this book. A very practical, easy to read book on the various psychological tricks and techniques you can use in persuading people to see things your way. I was recommended to read this with regards to negotiating with brands (making sponsored video content) and it has certainly beefed up my skillset. I've actually already used a bunch of tips from this book outside of formal negotiations, and I can confirm that much as some of the tricks sound unnatural on paper they really do work! As I say, the book is v A very practical, easy to read book on the various psychological tricks and techniques you can use in persuading people to see things your way. I was recommended to read this with regards to negotiating with brands (making sponsored video content) and it has certainly beefed up my skillset. I've actually already used a bunch of tips from this book outside of formal negotiations, and I can confirm that much as some of the tricks sound unnatural on paper they really do work! The book should have been titled "Start at No in Negotiations." Often, a "no" means "wait" or "I'm not comfortable with that." Probe deeper and listen carefully to uncover key information behind the "no" (such as "I want to but I don't have the money now" or "it is actually my spouse, not me, who doesn't agree"). This is a much more effective approach than trying to get the counterpart to say "yes," which the person might say just to get rid of you. The author, who is a former FBI hostage negotia The book should have been titled "Start at No in Negotiations." Often, a "no" means "wait" or "I'm not comfortable with that." Probe deeper and listen carefully to uncover key information behind the "no" (such as "I want to but I don't have the money now" or "it is actually my spouse, not me, who doesn't agree"). This is a much more effective approach than trying to get the counterpart to say "yes," which the person might say just to get rid of you. The author, who is a former FBI hostage negotiator, included too many hostage stories. These situations where lives are on the line, the negotiator would never split the difference (e.g., you take 2 hostages and I take 2 hostages) and hence, the book title. But for everyday situations (like negotiating with a family member, buying a car, or working with colleagues), the stories aren't that useful and such a perspective on negotiations isn't practical. Accusation List - list the worst things the counterpart could say about you (such as "you probably think I don't spend enough time on this project") and give statements to alleviate that concern (such as "You can trust me to do my part without supervision" and "we all want this project to be successful"). One of the most useful books I've ever read. 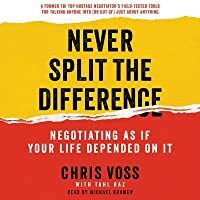 Full of great tips, practical examples and surprising points about negotiating (without the other party feeling they've been cheated), which can be used in business, school, or any casual situation. - Every negotiation starts with a "no". If you start with questions leading to "yes" (Do you want to help the world? Do you think we should stop animal abuse? ...), the other party will go into defense mode. By getting them to d One of the most useful books I've ever read. Full of great tips, practical examples and surprising points about negotiating (without the other party feeling they've been cheated), which can be used in business, school, or any casual situation. - Every negotiation starts with a "no". If you start with questions leading to "yes" (Do you want to help the world? Do you think we should stop animal abuse? ...), the other party will go into defense mode. By getting them to disagree early on, you'll establish boundaries and when they then say "yes", they really mean it (commitment yes). - Empathy is important. You can't negotiate without understanding what (and why) the other party wants. “WE’VE GOT YOUR SON. GIVE US ONE MILLION DOLLARS OR HE DIES!" And so begins this surprising book. The author begins the book by relating his experience at a prestigious seminar at Harvard University. Several of the college's top negotiators put him on the spot to see how he would negotiate in a hypothetical hostage negotiation. The author held his own against the expert negotiators, surprising the professors. How did he do so well? Mr. Voss explains that the methods used by the FBI were developed “WE’VE GOT YOUR SON. GIVE US ONE MILLION DOLLARS OR HE DIES!" The author held his own against the expert negotiators, surprising the professors. How did he do so well? Mr. Voss explains that the methods used by the FBI were developed over time, "products of experiential learning; they were developed by agents in the field, negotiating through crisis and sharing stories of what succeeded and what failed." In other words, these tactics HAD to work. If hostage negotiators failed, people literally DIED. The author discovered that the same techniques used in life and death situations could be generalized--they "made great sense intellectually, and they worked everywhere...In the twenty years I spent at the Bureau we’d designed a system that had successfully resolved almost every kidnapping we applied it to." 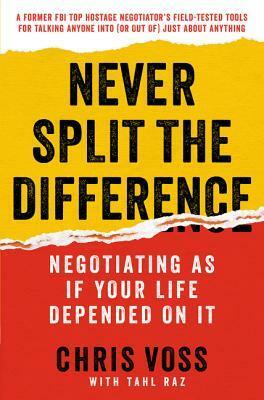 NEVER SPLIT THE DIFFERENCE is not just about tricky negotiation tactics, or ways to "outwit" your adversary in battle. Whether you are negotiating with kidnappers, or just negotiating a raise, the principles are the same. For example, people always want to be understood and accepted. "Remember you’re dealing with a person who wants to be appreciated and understood." This is true no matter the type of negotiation. This also means careful listening, or what the author calls, the martial art of "Tactical Empathy." It's nearly impossible to listen to the other side; so, you have to deliberately change your focus: "Make your sole and all-encompassing focus the other person and what they have to say. In that mode of true active listening." Each chapter in NEVER SPLIT THE DIFFERENCE begins with a real-life example from the author's involvement with hostage negotiations. Warning: Many of these cases are brutal, and oftentimes people are hurt, or even killed. After the real case is presented, the author then explains what negotiating techniques worked, and which didn't. At the end of each chapter, there is a nice wrap-up of the key lessons learned. One of the key techniques recommended is to "Be a mirror." You simply try to reflect back what is said: "The intention behind most mirrors should be 'Please, help me understand.' Every time you mirror someone, they will reword what they’ve said. " The book's title reflects the author's position that compromise, or "Splitting the Difference" is actually a lazy way to conclude a negotiation. It often gives bad results: "We don’t compromise because it’s right; we compromise because it is easy and because it saves face." However, a simple compromise is often "ineffective and often disastrous. At best, it satisfies neither side. And if you employ it with a counterpart who has a win-lose approach, you’re setting yourself up to be swindled." Instead of taking the easy way, Chris recommends working relentlessly to see "what is really motivating the other side." The negotiation is not so much a battle, as a process of "Discovery." Figure out as much as you can about what the other sides really needs. Even when the other side says, "No," that's okay. Use that to clarify what the parties really want. Figure out the other side’s “religion," or what truly matters to them. Finally, the Appendix contains detailed steps for preparing for an important negotiation. For instnace, list your goals, as well as the negotiating "tools" you will be using. Chris explains that in the heat of discussion, you will otherwise forget your tactics. All in all, I found NEVER SPLIT THE DIFFERENCE to be an impressive book, filled with practical knowledge, tips, and just plain WISDOM about how to deal with people. I like the fact that the tips and tactics are PROVEN techniques--not just some theoretical ideas. If you've negotiated with kidnappers, I'm pretty sure that qualifies you as an experienced negotiator. Advance copy for review courtesy of Edelweiss Book Distributors. What a phenomenal book. Who would've thought we could learn so much from a field that could not be further from our life: hostage negotiation. In the end this is a book about listening. It's a book about making people feel listened to. This is a compilation of secret weapons that works like black magic when put into practise. Read the three first chapters, try it, and I promise you will not be disappointed. -Use labeling to disarm someone and generate trust during a disagreement, for example: "it looks as though you want to do the following" "it looks as though you feel the following way"
-Asking questions you know will result in a no answer are very productive for example ask "what will you say no to today?" -To get a response when someone is ignoring your emails ask them "have you given up on this project?" -The objective is not to get others to say "yes" it's to get them to say "that's right" keep asking calibrated questions until they say "that's right"
-To understand who all the decision-makers are, ask open questions like "how does this affect the rest of the team?" "who else will be affected by this?" "how do others feel about this?" -Using your first name humanizes the discussion. Funny example I'm going to try for getting a discount at a store by saying "hi my name is Jeff what's the Jeff discount"
Fun short book from a former hostage negotiation expert turned business consultant. It's a bunch of techniques to use empathy and a few psychological tricks to understand what the other person in any conflict actually wants, and to steer the negotiation to where you want it to go. He calls his techniques "tactical listening" - I'm imagining buff guys with knee protectors, Kevlar vests and helmets all sitting down for a nice cup of tea, but sadly it's nothing like that, it's more about the weird quirks human brains exhibit (think Kahneman's Thinking, Fast and Slow, which is quoted a few times), and how to use those quirks together with good and attentive listening to your advantage. It's all very much about emotions, very little Homo economicus. Don't avoid conflicts, but embrace them. Try to find "black swans" (unknown unknowns, in this case unknown information about your negotiation partners) and use them, they're powerful. Make your "opponent" say "No" so you at least know where the boundaries are, work from there (I wish I could do that with science funding agencies). While I enjoyed reading the book, I couldn't help realize it was mainly about how to manipulate and use people in order to get your way. No matter how Chris worded his stories, examples, and techniques it all sounded like he is teaching "how to use others for your personal (or business's) gain. I honestly felt dirty reading it as it does teach how to be a horrible person to others while smiling and coming off as a great person. I'll say as some one with high functioning autism and learning "to b While I enjoyed reading the book, I couldn't help realize it was mainly about how to manipulate and use people in order to get your way. No matter how Chris worded his stories, examples, and techniques it all sounded like he is teaching "how to use others for your personal (or business's) gain. I honestly felt dirty reading it as it does teach how to be a horrible person to others while smiling and coming off as a great person. I'll say as some one with high functioning autism and learning "to be human" (communicate and function normally in conversation) it does help me to see just how evil people can actually be, and avoid them. I learned from this book, the signs of manipulation and deception when talking with people or negotiating. Powerful like a knife or fire. It reads as a description of a military tool that can be used to nurture, drive change and action but also to exploit so many of the biases that plague us as humans in a very effective way. I find some ideas very challenging from an ethical and moral perspective outside of the FBI crisis negotiation realm but that doesn't dimish their power. Definitely worth reading multiple times. Take what you need to improve your life and enjoy the important history lessons. A very useful book and one who's ideas I plan to test in the near future. I felt there was a lot of common ground with the charisma myth. This does not work well as an audiobook because there's a lot of filler and hot air. I agree with the starting premise of the book, i.e. that "Getting to Yes" is more or less useless because people aren't robots: When everybody involved is nice and logical, no one needs help with negotiating. Having said that, I'm not sure how especially useful his advice is. Personally, I got much more out of: . I would also recommend . The author there recognizes that introverts have different strengths/weak This does not work well as an audiobook because there's a lot of filler and hot air. I agree with the starting premise of the book, i.e. that "Getting to Yes" is more or less useless because people aren't robots: When everybody involved is nice and logical, no one needs help with negotiating. I would also recommend . The author there recognizes that introverts have different strengths/weaknesses vs. extroverts and tailors advice for them. Totally delivers what it promises and then some: a Talebian addition to the literature about negotiation. Good pace and a nice mix of theory, summary and real-world cases that makes this a thrilling read. The author, a former hostage negotiator, put together tips in dealing with others. This actually felt like a "How to Parent the Terrible Teens." So much of this reminded me of those years. But I really liked this one. He shares how to negotiate anything that you are up against...buying a new car, job raises, promotions, etc. I also liked how he related these lessons learned and applied them to normal life. So 4 stars. Also, the title was perfect for this book. - Active Listening: listen more than talk. - Mirroring: repeat the 3 important words in the last sentence your counterpart said. - Silences: after saying a proposal, something important or labeling/mirroring try a moment of silence, people feel uncomfortable with it and will keep talking. - Late-Night FM DJ voice: calm and deep. - Labeling: repeating the persons perspectives and feelings back to them. - Accusation Audit: before sending a harsh info or low ball, you say they’ll think you’re “bad and mean”. - Summaries: summarizes what your counterpart said and his feelings. - Paraphrasing: paraphrases what he said to show empathy and understanding. - Go for “That’s right” instead of “Yes” or “You’re right”. It means you understood how the person thinks instead of having him dodging you. - “No”: aim for a no question in the beginning instead of always going for “Yes”. - Deadlines: use them to apply pressure and create urgency. - Make them feel like not accepting your offer is a loss. - Questions: always use open ended questions to make them talk and solve your problems: “How” and “What”. Avoid questions that can be answered with yes or no. - Calibrated questions: make your counterpart bid against themselves with these, the most common one is “how am I supposed to do that?”. Basically they’re your way of saying “No” to their proposal but without doing it, this way avoiding to do a counterproposal. - Use ranges to be less aggressive (especially when setting the first price). - Negotiate non-cash benefits if their proposal is too low, instead of giving a far number. (“What could you offer me that makes this deal great for both of us?”). - Calculate three raises of decreasing increments to 85%, 95%, 100%. - Use lots of empathy and different ways of saying “no” to get the other to counter before you increase your offer. - When calculating a final amount use a precise, non-round number. - On the final number throw a non-monetary item to show that you’re at your limit. - Black Swan: informations that you don’t know and are game changers. Best way to find them out is to get to know your counterpart personally, ask open-ended questions, make them talk, and listen closely. Zajímavá a nad očekávání praktická kniha o vyjednávání. Raději jsem se připravoval, že budu zklamaný, ale zbytečně. Jednu hvězdičku si schovávám, protože to jistě lze napsat ještě o něco lépe, abych si z toho sedl na zadek. Ideální by bylo s praktickým cvičením, ale určitě něco zkusím sám i bez učitele. Nejspíš opravdu popisuje aktuální trendy ve vyjednávání, protože se v mnohém shodoval s tím, co na školení říkal Daniel Štrobl. Rovněž jsem si vzpomněl na jiné školení, kde jsme měli „protivníkovi Zajímavá a nad očekávání praktická kniha o vyjednávání. Raději jsem se připravoval, že budu zklamaný, ale zbytečně. Jednu hvězdičku si schovávám, protože to jistě lze napsat ještě o něco lépe, abych si z toho sedl na zadek. Ideální by bylo s praktickým cvičením, ale určitě něco zkusím sám i bez učitele. This book on negotiating also happens to be the best book on sales I've read in a long, long time. Most folks just skim the surface in their interactions with others, but this book will teach you how to set your ego and fears aside to break through the facades we project. Among other incredible insights, the author reveals techniques to uncover the information that makes a sale happen or not happen (what he refers to as black swans). Эта книга поменяла мои многие установки про переговоры. Очень чётко, без воды и множество примеров из практики автора. tried to use it when negotiating for a new car. Epic fail. Will need to spend a bit more time on it. Anyone will get something useful from this book. At the start of this old Nintendo (NES) game a player had to choose one of four characters. There was a footman, archer, wizard, and thief (I think). Each character had certain features. The footman was slow but strong. The archer was fast but weak and so on. None were perfect and after I died I always thought that if I only had the speed of the archer and strength of the footman. That idea came up while reading Voss's book. There were some sectio Anyone will get something useful from this book. That idea came up while reading Voss's book. There were some sections I recognized as things I do well and some sections where I recognized things I do poorly. Having the 'needs improvement' areas articulated and then actions to do so was very helpful.